Maxell USB Aroma Flash Drive: Can You Smell It? You really can’t blame USB manufacturers if they look for new ways to sell a product that’s been up and running for more than a decade, especially if they come up with crazy marketing ideas such as oddly reshaping and resizing the product, adding more (or lots of) color, or in the case of the Maxell USB Aroma flash drive, adding a range of scents. 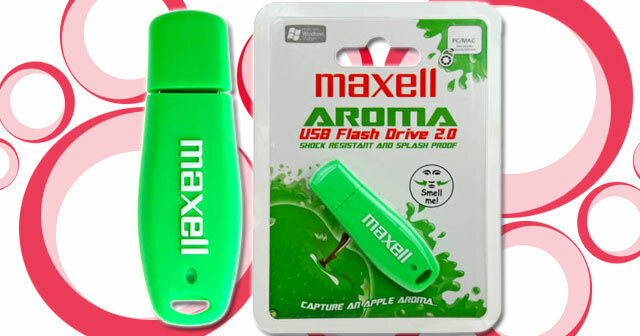 The 32 gram Aroma drive is part of the Maxell Fun range of USB 2.0 flash drives which is a group of flash drives that aims to cater to young, funky and fashionably trendy users. As the name suggests, the scented USB flash drive is similar to your favorite air freshener, coming in a multitude of colors with scents to match: apple, strawberry, chocolate, lemon, orange, and mint. By now, many of you are curious as to how the makers of this novelty flash drive devise such a feature. Many would have guessed that it starts to give you its scent once you plug it in your port, like a USB version of a Glade Plug-In. Unfortunately, that’s not the case. The Maxell Aroma USB flash drive is just your typical USB gadget, with the exception of its case enhanced with the unique smell. In other words, the flash drive’s plug and play capabilities have nothing to do with this feature. So expect that once you pull it out of its pack, you’ll begin to smell it right then and there. Except for having a scent, the Aroma drive works like your typical USB flash drive – allowing you to store your documents, music, pictures and videos. Its rubber casing protects the flash memory. The Maxell Aroma drive is also guaranteed shock-resistant and waterproof. Password software is included for the security-conscious user, and an LED indicator is helpful when the gadget is in use. A handy key chain to attach to the cap is also available, making it more convenient to carry around. The USB flash drive is equally compatible with Windows and Mac and comes in 1GB, 2GB, 4GB and 8GB. Maxell, a world leader in manufacturing optical drives, sells the flash drive at a price of $25 for a 4-gig one. Considering it’s just an ordinary flash drive masked by the scent of novelty, you may want to spend your money on another storage option. Does the promising scent of apple, chocolate or mint strike your interest? Is this a brilliant idea or does it just stink? Sound off below! This entry was posted in Articles, Flash Drive, Maxell, USB Flash Drives, USB Gadgets, USB Stick and tagged Cool Gadgets For Women, Maxell Aroma drive, Maxell USA, Maxell USB Aroma, Maxell USB Aroma Flash Drive, Maxell USB Flash Drives, novelty flash drives, scented USB flash drive, shock-resistant USB drives, USB 2.0 flash drives, USB gadget, waterproof USB flash drives. Bookmark the permalink.